Having had their fill of the beach, tourists seeking the 'real Rio de Janeiro' should make a beeline for one of its most iconic neighbourhoods, Santa Teresa. Located at the top of Santa Teresa Hill, the neighbourhood is famous for its winding, narrow streets, its 19th century architecture, and its amazing array of restaurants, bars, art galleries, and eclectic shops. 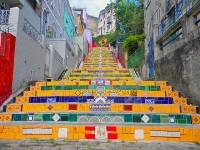 A popular area for local artists and tourists alike, Santa Teresa is best reached using its historic tram service, which runs up the hill from the centro (departing from Largo da Carioca square). The tram line, the only one of its kind in Rio, runs right through Santa Teresa's picturesque streets, offering magnificent views of the city below. By all accounts, no visit to Rio de Janeiro would be complete without spending at least a few hours in Santa Teresa.